WHAT IS THE PRINTART PROJECT? This is a project that gathers researchers from the Instituto Superior Técnico, the Faculdade de Letras da Universidade de Lisboa, and the Museu Nacional do Azulejo with the purpose of designing a software to aid the study and the identification of Portuguese tile art. Mainly due to the ease of reproduction and transportation, prints were used as the favoured means to make pictures and information available throughout the world. In this way, these art works quickly reached the hands of craftsman which used them as sources of inspiration, replicating them in different media, among which the tiles are particularly noteworthy. 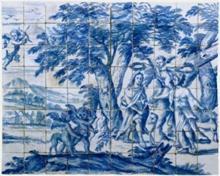 Trademark of Portuguese culture, the tiles have been produced continuously for five centuries, benefiting from the original prints in composition and theme, but using them freely; changing proportions, adding and removing figures, simplifying or enriching backgrounds, inverting figures, among other things. The project aims to develop a tool that enables the cross-reference of information, matching prints and tiles, so as to identify the original sources of any given panel, as well as matching the tile panels and the figures portrayed in them. Another goal of the project is the creation of an annotated database, which will be available to help future research on Portuguese tile art.